REGIONAL basketball in the country takes a new form in the Filsports Basketball Association (FBA) following its official launch early this year. Commissioner Vince Hizon hopes the concept will click this time as the league tries to maximize the potential of regional basketball and learn from the mistakes that led to the demise of the Metropolitan Basketball Association (MBA) in 2002. Hizon himself was a former MBA star who played for the Iloilo Volts during the league’s inception in 1998. “I joined (the MBA) some years ago and I realized that there is a lot of beauty in the regional concept but it wasn’t maximized. It is something that we can really take advantage of. People, no matter what, will be proud of where they come from,” said Hizon during the press conference of the league on Tuesday night. Aside from being regional, Hizon said the FBA is amateur in nature unlike the MBA which was a pro league. 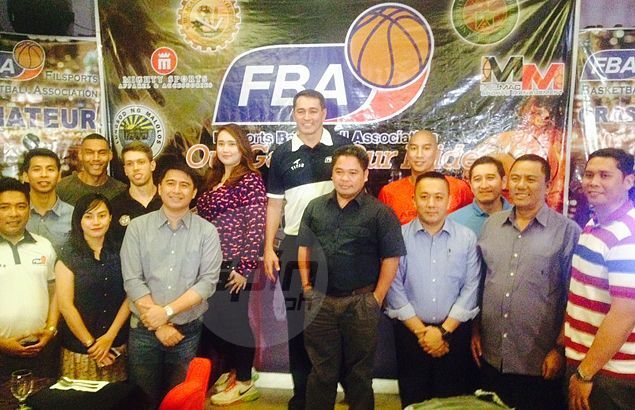 As an amateur league, the FBA also adopts a grassroots concept aimed at developing players. Hizon also made it clear the new league is not directly competing with the PBA or the D-League, stressing under its rules, every FBA teams is required to have six players from their respective localities. “We are not in competition with the PBA or even the D-League. We already made that clear with PBA commissioner Chito Salud,” Hizon said. “What I require to the teams that are not universities is that half of the team must come from the area they represent. We have to find good players in their area and develop them,” he added. The former Ginebra stalwart said the FBA’s ultimate dream is to have players from the league suit up in Asia’s first ever play-for-pay league someday. “I hope and pray that FBA players will one day be drafted in the PBA or join Gilas Pilipinas. Because that’s what our league is all about - developmental,” said Hizon. Composing the league roster in its maiden season are the Pampanga Foton Tornadoes, Numero Uno Antipolo Pilgrims, Malolos Mighty BulSu (Bulacan State University), Metro Racal Auto Center Artemis, Laguna Warriors, and University of the Philippines-Diliman. The FBA actually had its inaugural last January 24, with play resuming on Saturday at the Trinity University of Asia gym. Metro Racal Auto Center takes on Numero Uno Antipolo in the first game set at 3:30 p.m., before Laguna battles UP-Diliman in the 5:30 p.m. main game. PTV-4 will carry the games on television.